I just vacationed in Myrtle Beach, SC with the wife and kids, and like many other tech savvy media fanatics with children who visit hotels and resorts, I was well aware that you just don’t know for sure what kind of WiFi, data connectivity, or display/HDTV you are going to have at your disposal to connect your gear to, so I came prepared. Sure, the primary goal is to be on vacation and enjoy the beach, pool, golf, min-golf, attractions, etc., but what about dreary days with constant downpours (like the first two we had) or evenings when the kids just need a kids show on Netflix, etc.? No electronic entertainment of any sorts with two kids in a room with you these days is asking for trouble. Handhelds and tablets tend to lead to squabbles such as those over our iPad 3, which kept it put away for the most part, except while traveling in the van, so it’s good to have some options. 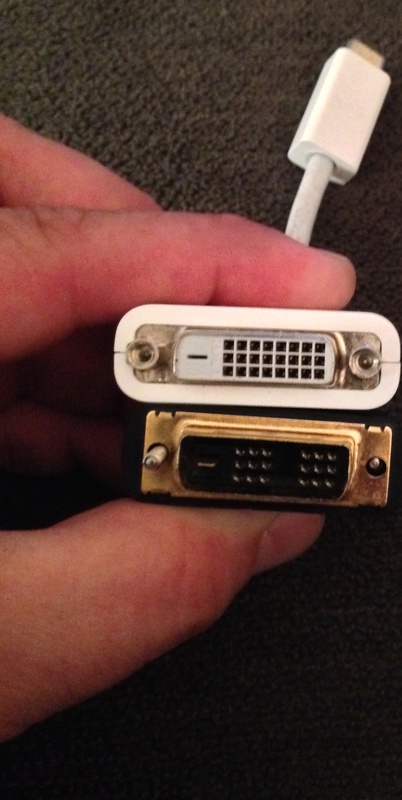 The mini DVI to DVI-D female adapter and a DVI-D male to HDMI female adapters are the perfect combination to connect your 12″ PowerBook G4 to a display with DVI enabled HDMI ports. This FireWire 400 to FireWire 800 cable allows you to connect older PowerBooks to newer Macs easily. On some of the newest Macs that lack FireWire, you can still connect this cable if you add a ThunderBolt to FireWire adapter. Upon arrival to the resort I stayed at, there were a couple of hurdles to overcome to get my portable gear up and running – which will be the same hurdles anyone else needs to overcome when traveling). As mentioned, it’s good to be prepared for multiple A/V connectivity scenarios when traveling. 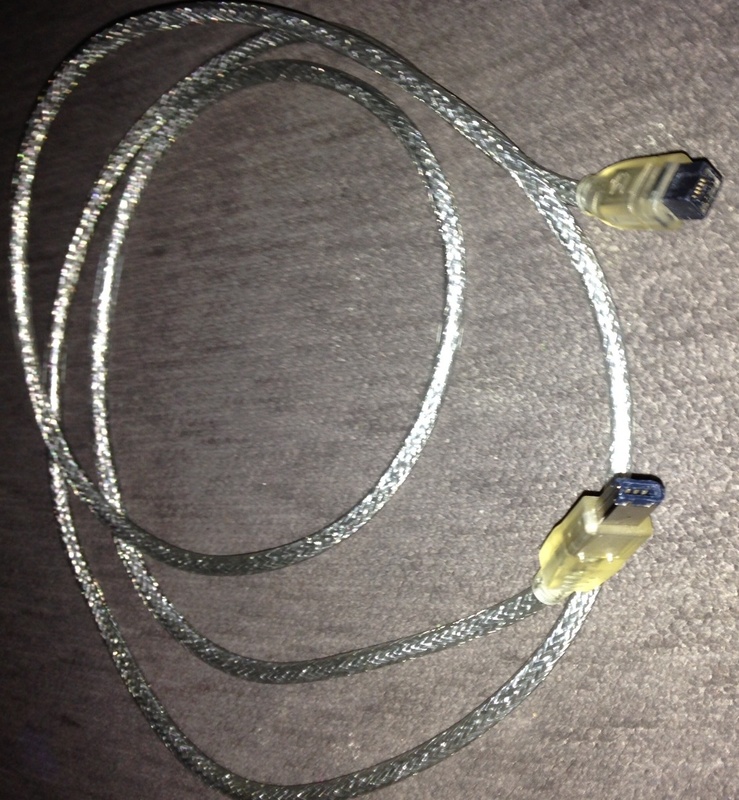 Older Plasma HDTVs you might encounter built between 2003 and 2004 typically have DVI connections instead of HDMI. Most HDTVs produced have historically been equipped with a VGA connection as well, so with the right adapters, you have options. In my case, the goal was to use an HDMI connection with the Apple TV for media and a VGA connection with the PowerBook for gaming. The TVs in both the main room and sleeping quarters were older Toshiba Regza 1080p TVs circa 2006 or 2007. The main room had a 42″ screen and the sleeping quarters had a 32″ variant of the same model. These TVs have three HDMI inputs (one port with DVI-in via HDMI), but no VGA or direct DVI connection, so I would have to simply swap the single HDMI cable I brought back and forth. No big deal. At least I knew I was covered, and when I tested connecting either device, I got a nice, crystal clear 1080p picture from the Apple TV and a crisp 1280 x 720 (720p) picture from the PowerBook. With that said, the first hurdle was overcome, and connectivity was a go. As many of you know, running an Apple TV is great when you are using your own personal network or a network that uses standard router encryption vs. an authentication portal. Unfortunately, since the Apple TV doesn’t have a web browser, there is no way to use public networks that require web authentication with it unless you set up a Proxy Server (such as another Mac) to obtain connectivity via the web portal and spoof the address. This resort uses a public WiFi connection with no router encryption and web authentication, so creating a Proxy with the PowerBook or MacBook Pro would have been my only option with the resort’s WiFi. Sure, I could have done that, but all that work would have been pointless, given the 1 Mbps WiFi connection I was getting from the resort’s free WiFi. Hmmm, what about turning my iPhone 5C into a hotspot and using a 4G or LTE connection in a pinch? My 2.5 GB data limit would surely have been exhausted quickly, but that too was not even an option due to excessive interference to the data signal and the fact that our room was facing the ocean, making my data connection too weak/spotty to be reliable for streaming media. Given these roadblocks, I was grounded to local media on the PowerBook, since I couldn’t get the Apple TV online and couldn’t stream to it over WiFi via AirPlay from the MacBook Pro due to the slow connection (a direct connection with a mini DisplayPort to HDMI adapter for the MacBook Pro for locally stored content could have worked, but I wasn’t about to go out of my way just for that or pay retail “cable tax” for it). Sadly, I didn’t have much media on the PowerBook either, but that’s when I looked over at my FireWire 400 to FireWire 800 cable I had brought by happenstance and that big “a-ha” moment occurred! Connecting two Macs together via FireWire can provide much more than Target Disk Mode. 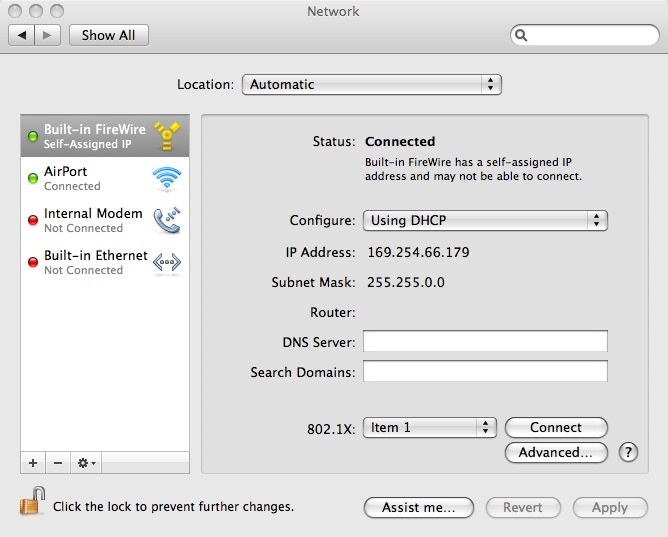 FireWire automatically assigns a local IP and creates a network when you connect between two Macs. At 400 or 800 Mbps, it’s still a speedy, viable alternative to many other means of connectivity and the best when linking older PowerPC machines. By connecting the 12″ PowerBook and 17″ MacBook Pro via the FireWire cable, I had an instant network between them running at 400 Mbps, and by turning on iTunes sharing from the OS X 10.6 Snow Leopard partition of the MacBook Pro (which had lots of locally stored media) running iTunes 10.6.3 (same version on the 12″ PowerBook G4), I was in business. I could now stream from the gobs of media I had stored on the MacBook Pro through the PowerBook with no WiFi needed. I had only left out one thing – audio. I didn’t bring a stereo Y cable to send the audio to the TV speakers, so I was stuck with the muffled audio output from the 12″ PowerBook’s speakers. Luckily, the clock/radio in our room had an integrated wired aux input (1/8″ stereo mini-jack) for iPods/MP3 players, so I just plugged that into the speaker output of the PowerBook, and it worked like a charm to provide a bit more audio oomph. All of this didn’t take long to resolve, but it was still cool to find workarounds using the things I brought and what I had on hand at my disposal. Using the clock/radio aux audio was definitely a “MacGyver” moment. We only watched a couple of movies as a family (Wreck It Ralph is still one of our favorites) and only played a few games, but when it was rainy and we were in-between indoor attractions/eating or when it got boring before bed, it was nice to have these distractions, and it kept the kids entertained. The moral of this story is to not count on having reliable/compatible internet or a strong enough data connection when traveling to run your Apple TV or other streaming box. As portable as that tiny box is, it can’t stream anything when there is no feasible way to connect it to a network, rendering it useless. A good media drive stuffed to the gills with a wide variety of digital backups of your personal DVD and/or Blu-Ray collection (especially plenty of family friendly content for the kids) is a good idea to prepare before going on a family vacation. Also, bringing something like a Mac mini with a small Bluetooth keyboard with integrated trackpad/touchpad or a 13″ MacBook/MacBook Pro (opposed to a 12″ PowerBook G4) is a good alternative, since these could run Netflix from the web, are nice and portable, and you can then authenticate via web authentication portals when necessary. Again, I can’t stress enough – don’t forget a selection of video cables/adapters (not just one solution) as well as audio, as they can cost an arm and a leg at retail or worse yet – you could just be out of luck if there is no convenient electronics reseller around. The next time I travel, I plan on having an even better solution. One of those wireless media drives from Seagate or LaCie is ideal. The one that is intriguing me the most at this time is the Seagate Wireless Plus (reviewed by Ars Technica). This drive can do it all in terms of media streaming courtesy of creating its own WiFi network. The Seagate App then allows you to easily stream to from iOS and Android devices (Kindle also supported) and also supports extending your Mac’s media library. The App interface is very much like Cover Flow, and when combined with an Apple TV via Airplay, you can push a wide variety of content to your HDTV. There’s other solutions out there such as Apple’s newer Time Capsule with networked storage, but what’s cool about the Seagate Wireless Plus (along with some others) is the built-in battery the drives have that keep the content flowing. You can easily keep it powered while traveling too, as they can charge via USB.